We’ve all heard the real estate mantra of “Location, Location, Location” as the ticket to selling your home. Well that is changing now to “Location, Location, Landscaping”. A study by RealEstate.com suggests that landscaping and hardscaping can deliver a return on investment as high as 150 percent – an ROI that puts it ahead of popular home improvement projects like kitchen or bathroom updates. According to RealEstate.com, for every dollar spent on upgrading a backyard or outdoor space, a homeowner can expect to get back anywhere from 60 cents to $2. With up to 14 percent added to the home’s resale value, on a $500,000 home that’s nearly $75,000. “When buyers are taken to a home that features state-of-the-art landscaping and elements like a fire pit and high-end pavers, there’s an immediate assumption that the inside of the house will be as spectacular.” says John Duffy of Duffy Real Estate. 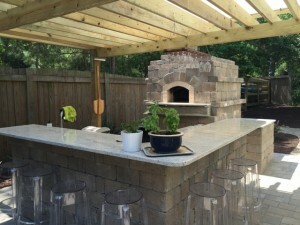 Outdoor living is very popular with today’s homeowner, they want to contract with a company that is an expert in their field. Outdoor living area’s extend your living space without the addition of a roof. The most popular items requested by homeowners now are: outdoor fireplaces, outdoor kitchens, fire pits, and paver patios. Yardworks, Inc. is an expert in all of these applications. Check out our new website www.yardworkslandscapes.com, visit our Houzz and Facebook pages and you can see some of the gorgeous work that we have done. © 2010-2019 Yardworks, Inc. All Rights Reserved. Site by Crystal Coast Technologies, Inc.